I had kind of a crazy day today, which involved changing up my work schedule and two naps, one of which just ended at 2 a.m. So after a lovely 3 a.m. dinner while watching repeats on the Food Network, it occurred to me that I have a comics blog that needed posting. World's craziest sleep schedule aside, I decided to do a quick art post, the inspiration of which goes to I-HoD's Frank's comment on my previous post. Click to enlarge. Don't forget your 3D glasses for optimal viewing. 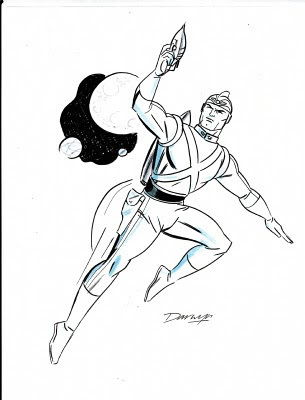 While the description at Comic Art Fans doesn't specify if this was a convention sketch or not (it does say "commission," but I don't know if that precludes it being convention sketch), you can tell there's a lot of thought put into this sketch. Nothing makes a sketch pop more than a little background element, I think, and the sci-fi retro Moon and planets in the background are the icing on the cake. And, hey, could that canalled planet be Mars? Darwyn Cooke is an artist I always admired because not only does his style evoke a certain era, but his composition and bold-yet-elegant inking style add up to an unparalleled dynamism in my book. Plus, I do appreciate a more realistic rendering of the human form, whose simplicity is a breath of fresh air compared to the hyper-realistic style of comic art today. And, boy, does that guy draw a killer ray gun! Woot!